ARTEZ, a French distillery, producing very long tradition spirits. 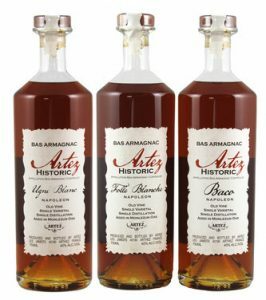 Bas Armagnac Eau de Vie, the oldest French brandy, Absinthe and Pastis Artez is producing are the authentic lifeblood of France, a concentration of aromas and flavours, the expression of the unique characters of the fabulous Gascony terroir. The vineyard spreads over 14 hec, made of Baco, Ugni and Folle Blanche grapes harvested, distillated in alambic and then aged separately in oak barrels. A large range (VS, VOSP, XO, Hors d'Ãrge and reserve ) in various presentations depending on customers' requirements. Artez also cultivate their own plants (up to 12 different herbs) for the absinthe and pastis productions. Artez is proud to offer these traditional spirits made without any conservative or artificial colorants. Very popular in the 19th century, then forbidden, they are today trendy spirits for cocktails or at cocktail hour with some cold or fresh water added. About the products: Vineyard location: a high, sun-bathed hill on the Western part of the Bas Armagnac. Soil: iron-rich sands (sables fauves), which produce eaux de vie that are generally supple in their youth and show a great finesse. Vines: the current vines are about 40 years old and the vineyard is planted with Baco, Ugni Blanc and Folle Blanche vines. Production: about 40,000 bottles per year Artez products are all natural with no sugar or caramel added.